Which U.S. president defended the railroad when this bridge was hit by a steamboat? 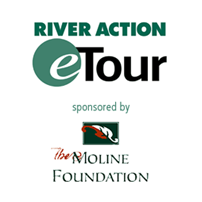 | River Action, Inc. Which U.S. president defended the railroad when this bridge was hit by a steamboat? 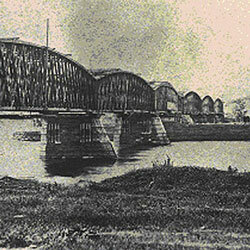 CLICK HERE to find out which U.S. President defended the railroad when the original bridge here was hit by a steamboat. This bridge pier monument marks the location of the first railroad bridge to cross the Mississippi River. The site was selected as the best strategic location for such a crucial commercial venture. In June of 1845, George Davenport hosted the first railroad meeting at his nearby island home. The meeting included prominent citizens from the area who understood the financial benefits of supporting a transcontinental railroad and building a bridge locally. 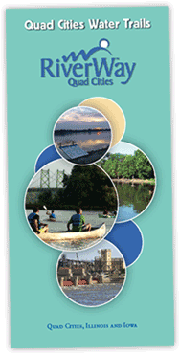 The island site was selected for use as a stepping stone. Two short bridges were built – one across a narrow section of the main channel of the Mississippi River and one across Sylvan Slough. The superstructure of the single track railroad bridge was timber construction. Spanning the Mississippi were five wooden spans, plus a draw span at mid-channel, painted white. It was considered a significant technological achievement for its time. On April 22, 1856, the first locomotive crossed the completed bridge. Fifteen days later, the steamboat Effie Afton struck the bridge. The Effie Afton was destroyed, and a span of the bridge was destroyed by fire. This incident led to a famous court case that pitted steamboat interests against railroad interests. Abraham Lincoln, then a prominent Springfield lawyer, defended the railroad. The initial trial concluded with a hung jury. In December 1862, the U.S. Supreme Court decided in favor of the railroad in a subsequent suit. The bridge continued to operate during the six years of litigation and flourished! Less than 10 years after it opened, the 1856 bridge was rebuilt to accommodate the increased volume of traffic. By 1872, a completely new bridge was built downstream. The original bridge pier was one of the earliest tourist attractions on the island. Today you can see the bell from the Effie Afton steamboat at the Rock Island Arsenal Museum.